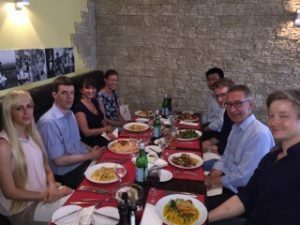 To give insight into different career paths the BFB (Bonner Forum für Biomedizin organizes dinners with different guests from industry as well as academia. This time we met Prof. Dr Hanno Wild who works as a Senior Vice President for Bayer in a nice Italian restaurant. In North Rhine-Westphalia, Bayer is well known to be a huge employer operating in crop science, animal health as well as in the pharmaceutical industry. Recently, Bayer has been in the news since the company aims to take over Monsanto, the huge US player in crop industry. When we met Prof. Dr. Hanno Wild who has been working with Bayer for almost 30 years, we learned about Bayer’s strategy to stay one of the few players on the crop market and about how a takeover of Monsanto by Bayer would pose considerable financial, organizational and also communicational challenges. But, moreover, we also learned about possible career paths in a huge pharma company like Bayer… and were surprised to meet a very down-to-earth and personable Senior Vice President. As the head of the Department for Candidate Generation, Wild is responsible for compound screenings to identify new small molecules for the different disease areas in which Bayer is operating. In his position at the Department for External Innovation, he coordinates the cooperations of Bayer with universities and research institutes, a task he is very enthusiastic about. Therefore, we wondered: How does one get hold of such an exciting and diverse position? Wild studied chemistry at the University of Bonn and did a postdoc in California before joining Bayer Health Care in 1987. At Bayer, Wild initially started as a Medical Chemist. He first worked on the identification of antibacterial and antiviral compounds and later on the development of small anticancer molecules, which at the end was a very successful project. During his time at Bayer, Wild spent time as a delegate in West Haven, US, for two years. Back in Wuppertal, Germany, he became responsible for the Medicinal Chemistry Department and is now responsible for several Departments based in Wuppertal as well as in Berlin. Retrospectively, when looking back on a very straightforward and successful career, I wondered: Does going to industry has opened up many possibilities for you? ”I sometimes regret to not work in academia. There is less freedom in industry when it comes to projects to work on. It actually happens quite often that a project is stopped and one cannot proceed working on it”, Prof. Wild remembered. At the time he went to industry, Wild had an offer from both academia and industry. But, since he already had two kids during his studies, going to industry was the more attractive choice offering considerably more security. Altogether, we enjoyed a great evening getting insight into how life in industry is like as well as what opportunities and compromises it offers. Therefore, many thanks to the BFB and the evenings guest Prof. Hanno Wild.